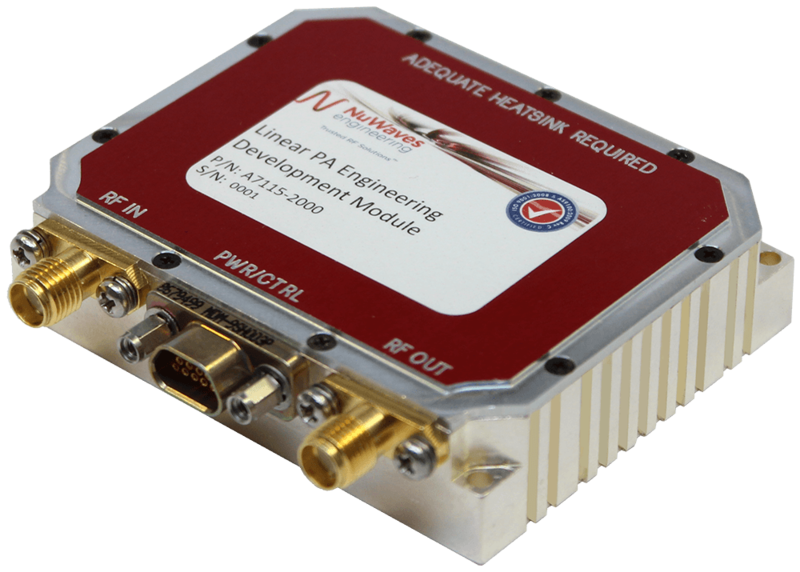 NuWaves also provides custom power amplifier design services to develop or tailor solutions that meet specific requirements, such as RF output power, linearity (e.g. EVM), or size, weight, and power consumption (SWaP). Our Bidirectional Amplifier Design capabilities will extend the range of your half-duplex system. Working with full-duplex communications instead? We’ve got you covered! 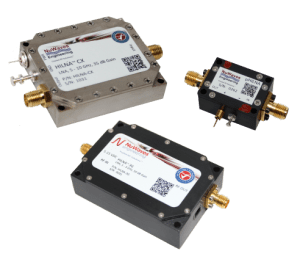 We offer Bidirectional Amplifier designs for full-duplex systems with filter capabilities to ensure that your communication links are operating without disruption or interference. Whatever your need is, NuWaves Engineering offers a full spectrum of RF solutions to maximize RF capability and readiness. Research, design, and development of a high-efficiency, high-linearity C-band power amplifier for unmanned aircraft systems (UAS) based on a custom Monolithic Microwave Integrated Circuit (MMIC) design using Gallium Nitride (GaN) material. This MMIC technology features state-of-the-art analog predistortion linearization and a Doherty power amplifier topology enabling very efficient operation, especially for amplitude-modulated waveforms such as 802.11, 802.16, LTE, etc. Single-stage LNAs – For use with Wireless LAN, Cordless Phones, and other 5-6 GHz Systems. Multiple stages with inter-stage filtering – For ways of distributing data like satellite, cable, and microwave signals. 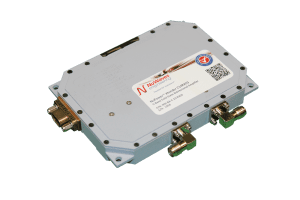 The NuPower™ LS100A01 L- & S-Band Power Amplifier is a small, ultra-high-power solid-state power amplifier designed for CW operation that delivers a minimum of 100 watts of RF power from 2300 MHz to 2500 MHz to boost signal power levels of data links and transmitters for communications range extension, electronic warfare (e.g. electronic attack), etc. 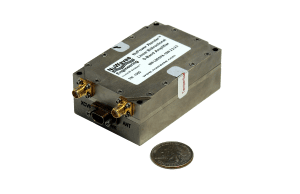 Based on state-of-the-art Gallium Nitride (GaN) device technology, the NuPower LS100A01 provides a compelling option for size, weight and power (SWaP) constrained RF telemetry and military communication systems given its 29 cubic inch, 22.6 ounce enclosure and 45% DC power efficiency. This robust power amplifier design provides capability to transmit both digital and analog modulation formats. This high gain amplifier design includes techniques to make the modulation mismatch tolerant. In addition to supporting multiple modulation formats, this commercial cell base station high powered amplifier design focuses on high RF output power, high gain, and broadband operation, and was successfully integrated into legacy systems. 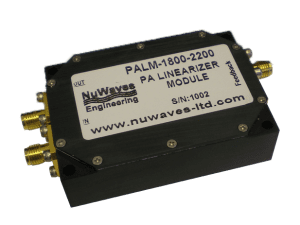 Available from frequencies from VHF trough 4 GHz, the PALM module is the ideal solution for linearizing Power Amplifiers regardless of their topology: class A, AB, and Doherty or device technology: GaN, GaAs, LDMOS. The typical improvement in adjacent channel power rejection (shoulder levels) is 12 to 20 dB depending on the modulation and signal bandwidth. With a power consumption of less than one watt, the Power Amplifier Linearizer Module module adds little overhead to battery operated system. Also, its miniature size (2.50” x 1.75” x 0.75” ) is well suited for integration in compact amplifier systems. A natural extension to NuWaves’ power amplifier design expertise and RF circuit designs, we offer advanced RF bidirectional amplifier design services as well as COTS bidirectional amplifier (BDA) products. Bidirectional Amplifiers are used with half-duplex data link transceivers to provide two-way signal amplification (i.e. both transmit and receive). NuWaves’ Bidirectional Amplifier design services deliver high-performance solutions that are in many cases started from existing circuit designs, thus lowering the development cost for our customers. Our design services and AS9100-certified quality management system help ensure that customers’ requirements and key performance parameters are met, such as DC power efficiency, small size and lightweight packaging (i.e., SWaP), high linearity (low error vector magnitude, or EVM), low noise figure, or a combination thereof. Developed as a small, lightweight, and power efficient (low SWaP) linear bidirectional amplifier ideal for extending the communication range of half-duplex S-band transceivers running amplitude modulated waveforms (e.g. OFDM, WAM, DVB-T, etc.). This Bidirectional Amplifier generates 5 Watts of linear RF power from 2200 to 2500 MHz given a 10 dB Peak-to-Average Power Ratio (PAPR) waveform. The integrated low-noise amplifier provides a minimum of 13 dB of gain in receive mode. This bidirectional amplifier is ideal for extending the communication range of half-duplex transceivers with constant-envelope waveforms (i.e. PSK- and FSK-based modulations, such as SOQPSK and GFSK), and generates 10 Watts of RF transmit power. 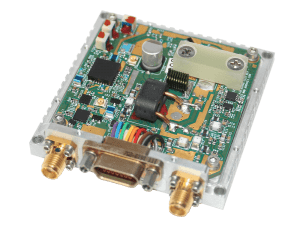 The module accepts a +5 dBm input level and provides 35 dB of transmit gain, all while operating with 30% or better power efficiency at most frequencies. 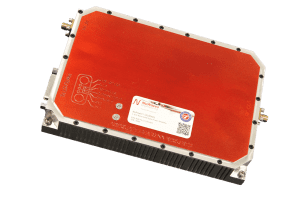 With a small form factor (3.8 cubic inches) and state-of-the-art Gallium Nitride (GaN) power amplifier device technology, the NuPower Xtender VHF/UHF Bidirectional Amplifier module is ideal for broadband RF telemetry. 5-Month development of a C-Band Bidirectional Amplifier with a 3.57″ x 2.57″ x 0.50″ and 2.6 oz. form factor capable of providing 10 Watts of RF output power from 4400 to 5100 MHz.